Stephen Usery interviews Molly Caldwell Crosby about her book Asleep: The Forgotten Epidemic That Remains One of Medicine's Greatest Mysteries. 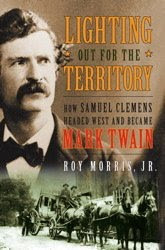 Podcast - Roy Morris, Jr.
Stephen Usery interviews the editor of Military Heritage magazine, Roy Morris, Jr. about his last look at nineteenth century America with Lighting Out for the Territory: How Samuel Clemens Headed West and Became Mark Twain. Stephen Usery interviews PEN/Malamud-winner Richard Bausch about his latest collection of short stories, Something Is Out There. Stephen Usery interviews best-selling author Elizabeth Kostova about her new novel, The Swan Thieves. It follows psychiatrist Andrew Marlow as he tries to discover why painter Robert Oliver tried to attack a painting in the National Gallery of Art in Washington, DC.